I needed a birthday card for my nephew Felix, who has just turned 6. I turned the sketch around to see what I could come up with, and on its side, I immediately thought of race cars. I wanted to personalize the card, but still stay true to the sketch, so I added his name in iridescent embossing across the top (can you see it? It's tricky to photograph! )- a subtle touch that makes it special, but without cluttering the front panel of the card. The car is Inkadinkado , the exhaust is a sun ray stamp from Practicing Creativity Designs, the 6 is from Impress, the sentiment is an old Lizzie Anne Designs stamp and the "FELIX" is the Tall Solids Alphabet from My Stamp Box. I used Kaleidecolor Desert Heat for the orange stamping. I hope you'll play along - I can't wait to see where this sketch takes you! I LOVE this cute and very clever card. Just love the hues of orange. The embossed "Felix" is such a great idea. I will need to CASE that aspect of the card in the near future. Oh Wow!! Ardyth - this is a super cool card for a young man! Love the subtle sheen too and the graduated colouring is fab! Love it! Fun idea!! Love how you interpreted the sketch!! Awesome birthday card! What an AWESOME card Ardyth! The large sparkly name is super fun. What a great idea to turn the elements into racing cars!!!!! This is such a cute masculine birthday card!!! I love this card. It could have just as easily said 60 as 6. Oh my gosh. I can see his name. This is beyond awesome Ardyth!! Now this is one cool card! I have a boy that age and I know HE'D love it! Love the colors too. What a cool card! Just perfect for a 6 year old! Absolutely fantastic! Love the subtle embossed name, he will adore it too! Too cool. Great for a kid and my cardmaker heart loves his name embossed so sublimely! Fab card, Ardyth! You're gonna be one favourite Aunt! I love the subtle embossing for his name, and I like how the Happy Birthday cuts through the number. Felix is going to be thrilled! 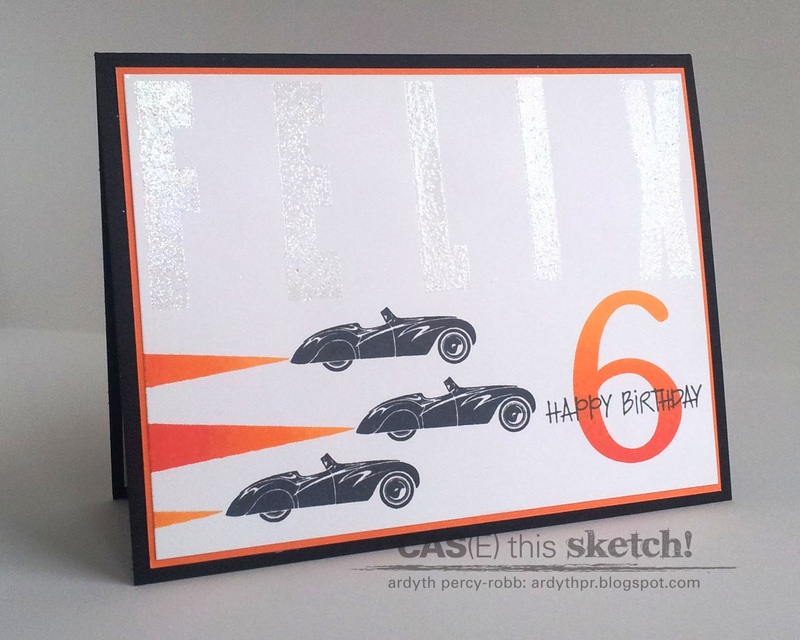 Such a cool card for a six year old young man! Love the embossed name...so cleverly Ardyth! I totally missed the last sketch (I think) so I hope to get this one. Turning it and making this totally fun card for Felix is pure genius, Ardy! This is a super cool card, Ardyth! I love how you filled the card but kept the white space white buy using the sparkle. Very cool! [sigh] seriously, make it stop, my head hurts!! Way cool design, and so completely perfect for a six-year-old. I know the iridescence was to stay with the sketch, but I couldn't picture it any other way. Love the gradient orange flames!